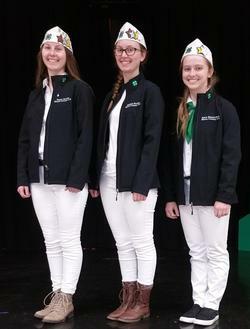 4-H County Ambassadors serve in the highest 4-H leadership role in Marin County 4-H. The 4-H County Ambassador position not only recognizes a member's leadership abilities, but it is also a working honor. A core component of the 4-H County Ambassador program is youth working collaboratively to develop, implement, and evaluate a Plan-of-Action to strengthen the 4-H program. Additionally, 4-H County Ambassadors are liaisons between the county 4-H office, 4-H members and volunteers, and the public. They visit 4-H clubs in their county, network with other organizations within the community, and represent their county at the annual 4-H State Leadership Conference. 4-H County Ambassadors are role models for their fellow 4-H members and their community. Read more on the state 4-H website. Time Commitment: Minimum active participation for 12 months, from July 1, 2019 to June 30, 2020. Youth will continue participating as a 4-H County Ambassador until their cohort’s Plan-of-Action is completed (average time is two years). Youth may continue in the 4-H County Ambassador program for multiple years, as long as they are eligible to enroll as a youth. Applicant must be between 14 – 18 years old by July 1, 2019. Applicant must have completed at least one year of membership in 4-H. Applicant must have demonstrated leadership experience and skills. This may be demonstrated either through a Gold Star or through mastery of a project as demonstrated by at least 6 hours of instruction, 40 hours of significant leadership roles, 30 hours of citizenship and/or community service, and 10 public speaking engagements. Completing a 4-H Record Book is NOT a requirement. Having a gold star is NOT a requirement. Develop, Implement, and Evaluate a Team Plan-of-Action: New first-year 4-H Ambassadors will work as a cohort to identify, plan, and implement a project to strengthen, expand, and improve the Marin County 4-H program. The project should have roots in the young people’s sparks/passion, have an enduring impact on the Marin County 4-H program, and be approved by the Adult Advisor and 4-H Office. There is no set amount of time the Plan-of-Action may take to complete. Be an active contributor to the 4-H County Ambassador program. Youth must attend at least 80% of 4-H County Ambassador meetings, follow the 4-H Code of Conduct, be a member in good standing, and be active contributors to the functions of the 4-H County Ambassador team. Attend the 4-H State Leadership Conference (typically July or August at a UC campus). Advise: Help the UCCE 4-H Office make program priorities. Participate and be involved in 4-H decision-making through the Marin County 4-H Council and the UCCE 4-H Office; represent youth on the Marin County 4-H Council. Mentor: Help lead the Marin 4-H Teen Club. Act as a role model to 4-H members; visit 4-H clubs during the year; be integral part of county officer’s training event; host a 4-H leadership development event for younger members. Plan: Attend and assist with Achievement Night, Presentation Day, Farm Day, Fashion Revue, and West Marin Fair. Support county 4-H events in key roles such as: parade marshals, emcee, plan and coordinate events, and serve as evaluators. Promote: Present a positive image of 4-H; act as a 4-H Ambassador; represent 4-H to outside organizations. Wear 4-H attire and/or Ambassador attire at 4-H functions. Present 4-H to community organizations, write an article for a newspaper, or create a display at the library. Teach: Lead workshops or sessions at club, county, area, and state events. Upon successful completion of the cohort’s project, and by being an active contributor to the 4-H County Ambassador program during their tenure, youth will be conferred the “4-H All Star Award” consisting of the All Star patch and pin. This will take place at earliest 4-H Achievement Night.